"I have kind of a love hate relationship with paper"
It's a continual thrill, scanning the shifting horizon of street art, eager to spy whats new and evolving. Recently, it was a pleasure to be able to discuss old world painting, alternate personas, and a sumptuous new body of work, with London artist DONK. TAG: How important is exploration of the alter ego? Given your works seem to play around with alternate identities, and a theatrical sense of play. DONK: Well, I am quite interested in the alter ego. It is a great way of freeing up & playing with notions of identity. You are able to concoct visual elements which lead you to a final sensibility. That final Sensibility being very important to my work. 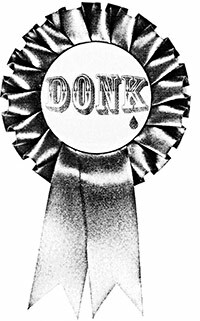 TAG: You yourself have elected to present DONK as your pseudonym. Is anonymity and masks a conscious feature? 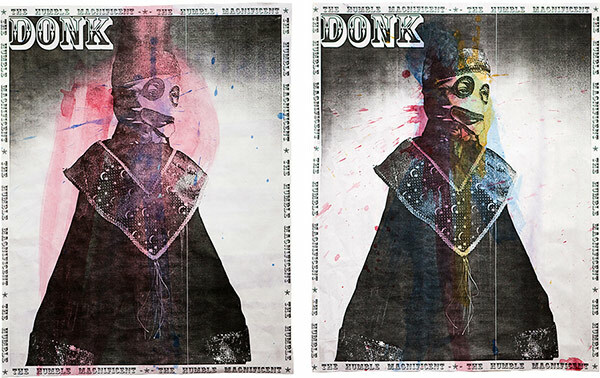 DONK: Apart from the convenience of not being easily tied to the unsanctioned street work, it is also as you say more theatrical and lends an air of mystery, which I personally think adds something to the mix. It's not as if it's really important to know who I am anyway. The Donk pseudonym was a bit of added fun really, I wanted something to tie the works together that was unpretentious, childlike and little gonzo. I like the idea that Donk could be a non-age specific and non-race or gender specific thing, just a kind of imaginary thing! TAG: Your more better known works - including B.brave - have a wonderful sense of romanticism, and a very anachronistic styling, as if advertising the kind of touring circus oft sung about by Tom Waits; do you enjoy playing around with this kind of paradox? DONK: I do. I try to create genuinely emotive image's whilst at the same time trying to avoid over sentimentalising or taking things to seriously. I think this contradictory process creates a natural conflict within the imagery which in turn results in a kind of pathos or mixed emotion! I like this sense of something happy and simultaneously a bit sad, like our occasional awareness that we are in specific moment just as that moment shifts and is suddenly gone. I think music is great at opening these emotional connections. I suppose I am trying to do something similar but in visual terms. Ultimately I try to communicate something quite soulful and authentic. Music is definitely a major influence and I have tried to incorporate musical reference here and there. I stencilled John Grant lyrics onto a piece a couple of years ago. I thought the lyrics added an extra layer of potential meaning. TAG: Similarly, there is something in your paste-up creations reminiscent of Dutch Master painters - particularly given the use of your own son as a form of muse - much like Rembrandt's 'Titus, the Artist's Son'. Do you envisage continuing the genesis of this approach? DONK: I do feel there is some visual relationship between my work and old world painting or religious imagery, I guess I am attracted to the melodrama of it all and the idea that these old works would have carried so much power in their day, you can still feel it to some degree. I would like to continue using my son in the work, though that is really entirely up to him. I'm sure he will humour me for a little while yet. I think it would be amazing to have pieces he was part of which spanned from his early childhood through to adulthood. My sons arrival really did bring about a lot of self-realisation and new found purpose for me, and also brought a lot of fun too. 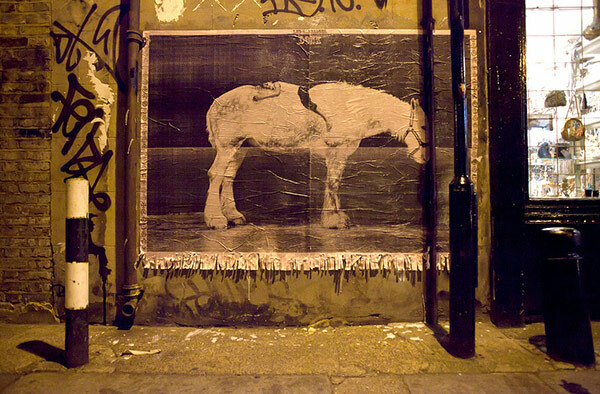 TAG: It is suggested that location is a key factor in your artworks, and their placement. Can you elaborate on this? 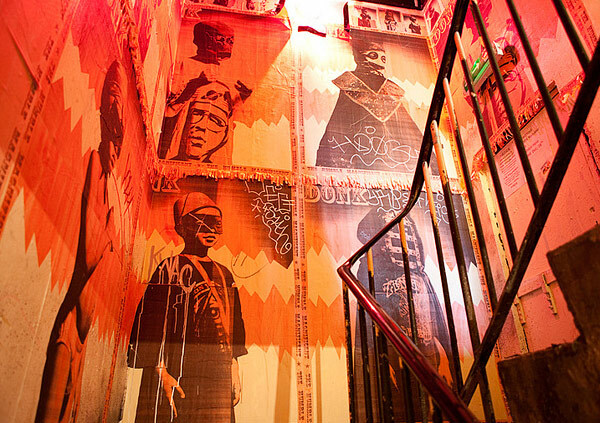 DONK: I guess location isn’t as important to my work as it is to the purest of street artists, who try to create a dialogue with structural elements of the street itself or attempt to make some kind of social comment. I think my images work on a more subliminal level by playing with mood's and atmosphere's. Location is important though, as i'm trying to communicate with a street audience via a poster based language devised specifically for the street. I think context is as important to me, by placing the work out into the city I grew up in, and where my son is growing up, I feel I can connect directly with an audience and hopefully communicate a positive desire to belong and stake a claim in the community. A sense of belonging or the human need to belong is key within my work. One of my early exposures to this idea came via the book subway art which came out in the eighties. I was at school in Hackney when this crazy book turned up with all these amazing maverick graffiti writers in it, some with incredible individual style's others with prolific or daring output, but the one that really got to me and stayed with me was the Puerto rican writer Lee Quiñones who painted train cars with giant tribute messages to his mum and girlfriend. I just connected with the simple, emotional honesty and commonality of these touching messages. I hope there is something of this spirit in what I am doing. 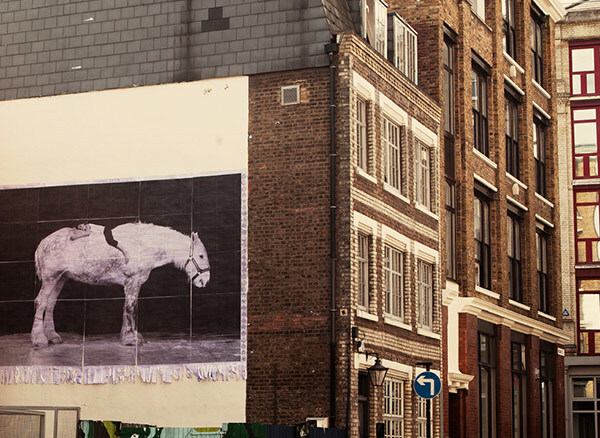 TAG: Likewise, do your paste-up installations offer a dialogue of any sort to the onlooker? 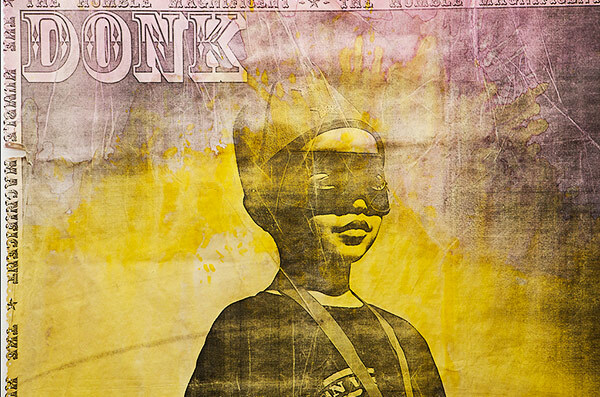 DONK: I hope so, in as much as I think people are naturally curious and surprisingly in tune with the subtle changes in their environments, so I hope, from time to time, my work might inspire someone else to take their own ideas out on the street. I have regularly had people bomb my posters with tags which is a kind of dialogue. If nothing else I hope the onlooker gets a sense of someone trying to communicate something heartfelt. TAG: What would you say drew you to paste-up as a delivery method for your work? 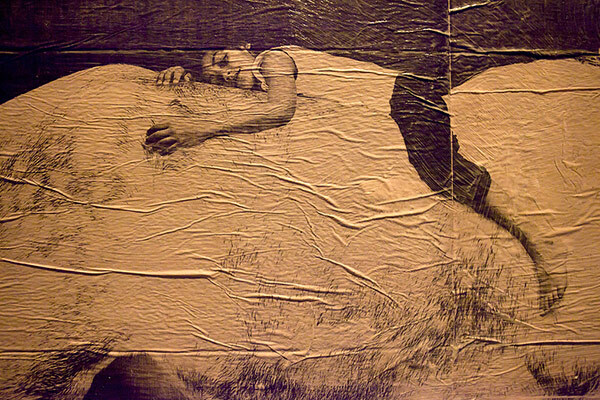 DONK: My work comes out of photography so the next natural step for me was always Xerox. Yes, I think paper on the streets has it's own challenges, strengths and weaknesses. It's definitely the most transient of street mediums, it's incredibly vulnerable in some way's and surprisingly durable in others. I have kind of a love hate relationship with paper. I am still experimenting with it's potential really. TAG: Is the ephemeral nature of paper on walls something that concerns you? DONK: Yes, as I said the paper I use is super vulnerable in an outdoor environment and as such it does get a proper battering by the elements particularly in this country. To me this fragility complement's and at times amplifies the emotive nature of the work and helps to distinguish it from the high end advertising posters. It does mean however that posters will disappear on impact sometimes, which can be frustrating and a little embarrassing. I do sometimes cut strips or tassels at he bottom of the the posters as a form of added decoration. The idea was to create an element of movement as they catch the wind, but also to add a touch of added melodrama. TAG: Tell us about your new series of hand-dyed prints. 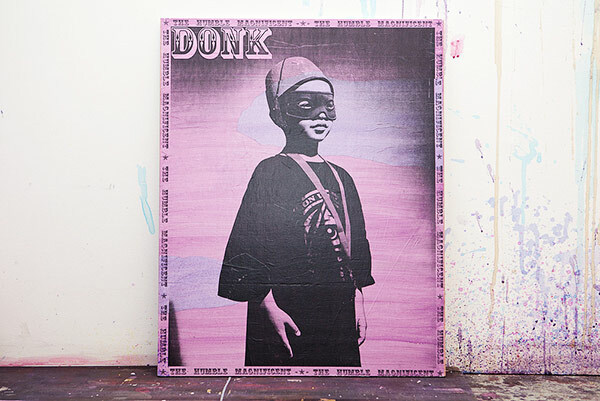 DONK: It's my first edition screen print and i'm really pretty excited about it. It's my B.brave image, and I've developed a screen printing technique that remains quite true to my street work. I basically hand colour wash each sheet of paper with indian inks then hang, dry and flatten them before cutting cropping and screen printing the image over the top. I use a similar process with my posters where I colour wash the photocopies. What I like about this process is you end up with the continuity element of screen printing combined with a process that results in something unique to every print. TAG: Is there a plan of action for the years ahead? 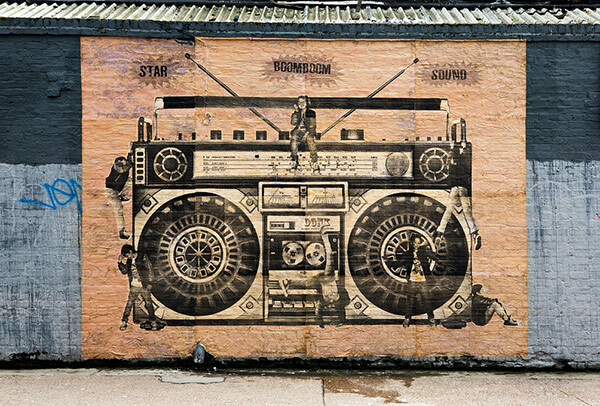 DONK: Plans for the future are to continue making new pieces of work in a similar vain and keep pasting and pushing the work on in the right direction. A friend of mine has made a Donk a website so I can update people on new projects and screen prints as they become available. I really want to explore the possibilities with screen printing in general and gradually print up may back catalog of images. I have an idea for a new image which concerns the diminishing returns of substance abuse, which I am really keen to get done along with some other ideas which have be cooking away. I hope to do some collaborations and to have some kind of show at some point too, possibly in a pub! TAG: Are they available for art collectors to purchase? Original photographs © DONK 2013.